Il Tetto is the fancy new roof top deck downtown. I'm pretty amazed at the number of roof top decks that have opened just within the last year.... Skybar, Carson City, Blue Line Grille, Steel Cactus, etc. Pittsburgh's new obsession with outdoor seating is fantastic. Il Tetto offers a very limited menu that is completely different from the selections available downstairs at Emporio. (Emporio is the Sienna Mercato meatball restaurant. My review of Emporio is available here.) So be sure to grab your meatballs and discounted beers downstairs at Emprio before you take the elevator ride to Il Tetto as the rooftop bar does not offer meatballs or happy hour specials. 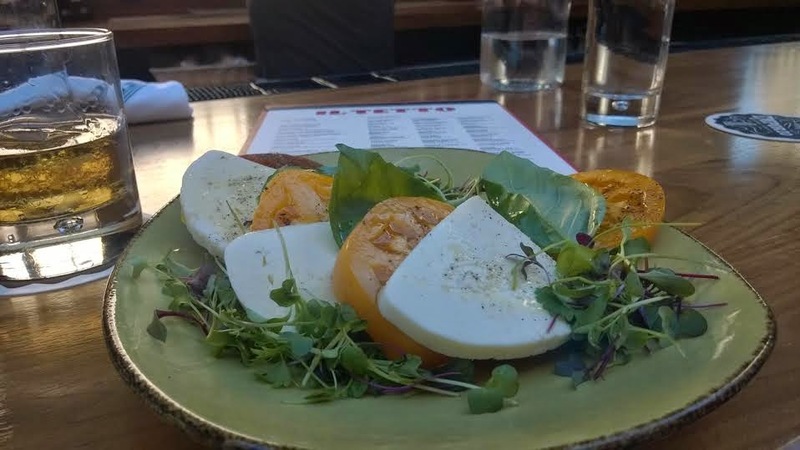 Some of the selections available at Il Tetto include fried head cheese, home made sausage, marinated olives and my delicious caprese salad which is pictured above. My caprese salad was very good. It was made with extremely high quality olive oil from Lodi Olive Oil co, basil, fresh tomatoes, some remarkable mozzarella and some micro greens including cilantro. Someone did a fine job of selecting a delicious tomato for my salad. Great work Il Tetto! Although I found the addition of cilantro to a caprese salad to be rather odd, it seemed to work as it was used sparingly. My chief complaint about the salad, and about Il Tetto in general, was the pricing. The salad cost $14 and each drink ran somewhere between $7 and $15. I think this is very high for Pittsburgh, even with the beautiful view of the city. It is my personal belief that if I'm paying $14 for a salad it should come with some type of protein or at least a lap dance. However, based on the size of the crowd the last two times I've visited Il Tetto, it would appear that the general public disagrees. It is true what they say, you pay for the view.